You’ve been waiting for this day for a long time. Both you and your fiance have tried the food selections, you hired your Michigan DJ company, and secured dates with all your other vendors. What are you missing? Have you considered how much of an impact uplighting will have on your reception? Your space can match your linens, ever your centerpieces. Computer controlled lighting system give you the freedom of matching with over 16.5 million colors. Dance inside your name with a custom monogram projected onto your dance floor. Color your ceiling in a variety of hues or make your centerpieces really shine. 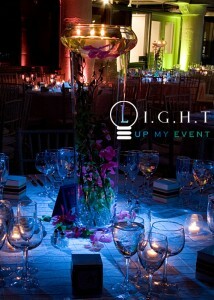 Since a majority of clients don’t consider uplighting it is always thought of as an after thought. It is important to allocate more of your budget to lighting as it gives you more bang for your buck with transforming your wedding venue, photos, and videos. Even if you want to avoid the night club feel of a room with lighting fixtures, you can still obtain a sophisticated elegant vibe with lights. The lighting when computerized can match the mood of your party. This means if the music is slower, your lighting will be a static color. The intensity of the color and patterns depend on the style you want. This is why I recommend meetings in our studio to get a full understand of how your want your space to look. Breakup patterns are a great way to give your venue a layered look. These will give the illusion that there are designs on your walls, or foliage on the ground. Breakups create a beautiful backdrop for images in places behind your head table. When choosing colors, you have the option of going with one or two samples. Lighting can be staggered around the room to blend the two together. The goal every couple wants is for their guests to say WOW when they walk through those doors. Any company can set some lights to a single color. It takes a real professional to enhance architectural features of your venue. First of all, the company will have to select the right color. This can be done based of a sample piece of fabric. What if you want to change the color the day of, is that possible? Working with LED (light emitting diode) fixtures, gives the ability to change the color any second. These fixtures cost more than traditional gels, but give you a modern look. Gel par cans were done back in the 80s and are considered an old school method. With computerized lighting, the room can change colors with the mood of your party. Another benefit is that they need less power, this mean you don’t have to worry about heat or popping circuit breakers. 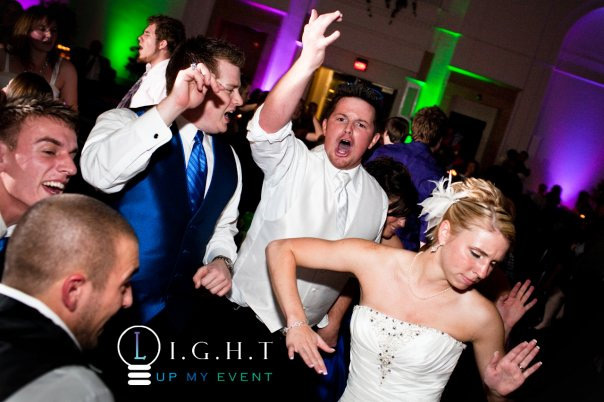 Just imagine power getting kicked off at the beginning of your first dance. I’ve heard of it happening with other “lighting” companies, it’s a bad situation! As important as it is to express what you want done, you need to take your lighting designers recommendations seriously. They will know the limitations of the lights in your venue. Since no two halls are the same, this means you might not get the exact look you had in mind. Some places have high ceilings, other have pillars without power. If you are working with dark walls (brick, stone, wood), this will affect your saturation of the lighting making it less visible. It is best to light up spaces that have neutral colors. Those rooms are less likely to change the color of the lighting. All of these factors will be taken into consideration by the lighting company you are working with. The type of fixture will be dependent on it’s application. For example, Par-cans are for tighter beams over longer distances. Pallets are used to wash more space in color. Any dark colored walls will need to be covered by draping fabric to give a black canvas to lightup. Moving heads with a frost are pefect for washing ceilings with colors. You want to make sure the company has bright enough lights to give the WOW effect. Any outside lighting will be done by fixtures rated to handle water conditions. This means that they will be IP65 ready to light up trees and buildings. You also might need to get remote power to these places and battery packs are best for these type of situations. Any lighting quote you get will be based on what you need to get the job done. Once again a 10 minute long conversation should give you a good idea of what to expect. Your pattern will be custom designed based on your input. We included dozens of samples for you pick from, and if there is anything you want just send us an e-mail and we will recreate it. This image is done with a gobo and is focused onto a wall or dance floor. Just picture dancing inside your name at your wedding reception. Guests always love this effect, they will take photos of it and give you compliments on the nice touch. This add on is very reasonable compared to other options. Since the gobo is specially made out of steel, there is a 2 week wait limit on this option. It can not be added on last minute. 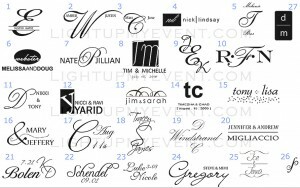 It is best to give your company a heads up so that they can ensure your monogram will be available for the reception. You dedicated a lot of time and budget towards your centerpieces, make sure guests really notice your work. In order to make the rest of your lighting look amazing, you will need to dim the lights at your venue. When you do this, it also takes away the attention on your center pieces. It is important to light them up by pinspotting them. This can be done discreetly by aiming the fixtures from the corners of your room. The beam is directed onto the floral arrangement from high up, preventing the spot from getting into guests eyes. This is another common lighting upgrade that can really enhance the overall look of your room. Are you looking to highlight a dynamic part of the wedding? How cool would it look to have a followspot aimed on the doorway during your grand entrance. Intelligent moving heads are best used in this type of application. It focuses the attention where it needs to be at the appropriate time. This could also be on the cake when you cut it, or on the dance floor for formal dances. Not many receptions go to this level of personalization and it always WOWs guests. So how will you highlight your reception? Keep in mind that anything with crystals or beads will shimmer with followspots. Other vendors typically like this type of lighting because it really gives them the best exposure for photos and videos. It will take at least a half hour to program the fixtures, so make sure to give your lighting designer extra time to set all the visual cues. 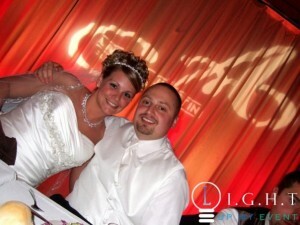 Uplights and a variety of other methods really give a special glow to weddings in Michigan. Not only will it look amazing in all your footage, but your guests will tell you how beautiful it looks. Overall, it leaves a lasting impression on your wedding day. Lighting is one of the most cost effect ways to transform your space into something magical. However, there are only a handful of professional lighting companies in Michigan. It is more than just placing lights on the ground and setting it to a color. To get a good idea of the companies skill, ask to see a portfolio of recent work. Reputable companies stay busy which means popular dates book fast. The cost will really vary but most dependent on your room dimensions, level of service, amount of fixtures, and hours of use. 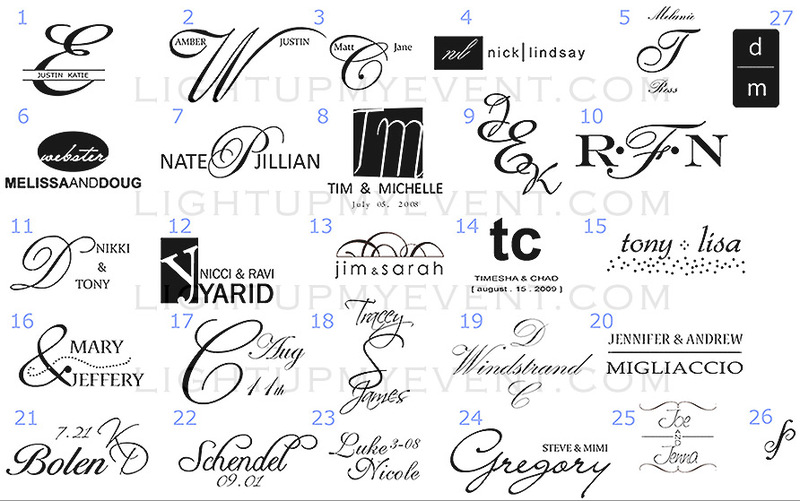 Nine times out of ten, couples that have seen lighting done right make it a priority to have it at their wedding. It is really that powerful. Proper lighting can really make a wedding event facility pop! We strongly encourage our brides to utilize special lighting such as up lights, washes and pin points and spots as this site mentions. Great photos!